A summary of key Connect Care happenings coming in January 2018 has been posted to the Alberta Health Services (AHS) internal Connect Care website, linked below. Now that the clinical information system has been configured to fit AHS workflows, build efforts shift to clinical system design. An online training environment will be readied for the end of the month and the first round of system testing will also complete by month's end. Signalling our shift from content and configuration to testing and training, a Wave 1 Launch event on January 17, 2019, will focus attention on all we must do between now and November 2019. The Alberta Health Personal Health Record project continues to evolve, transitioning to a new phase with new software in the first quarter of 2019. Previously an Internet offering based on the "HealthVault" program, and available to limited pilot-test populations, a new platform will better accommodate the smaller screen sizes of mobile devices. The re-designed offering, to be launched as "MyHealth Records", provides a secure online digital health portfolio that can be used to gather, manage and track personal health information. MyHealth Records will give adult Albertans the ability to view some of their health data from the Netcare provincial electronic health record. This includes recent medications dispensed from participating Alberta pharmacies, many immunizations administered in Alberta and some common laboratory test results. Uptake of MyHealth Records can shift how Albertans relate to health information and to their healthcare team. Assistance will be available for users should they have any questions or require help. A call-in line will provide troubleshooting advice and will also connect users to Health Link 811 should users have any questions about health information released on MyHealth Records. As we move toward a single Alberta Health Services (AHS) clinical information system (CIS), the way patients' medical record numbers need to be standardized. Medical record numbers are used to ensure that an individual's health record remains unique. Currently, patients are assigned different medical record numbers at each care setting they visit. Over time, most Albertans have accrued multiple facility-specific identifiers. The introduction of the Alberta Unique Lifetime Identifier (ULI) helped, giving one identifier that could be referenced at all sites. However, this Alberta Health maintained ULI does not apply to all patient populations and, for technical reasons, it can take longer to generate than the creation of a health record demands. The Connect Care CIS adopts a one-patient-one-record-one-system model. A Connect Care provincial medical record number (pMRN) will apply anywhere and anytime AHS facilitates care. It is unique, can occur only once per patient, and is created or retrieved whenever a patient interacts with AHS. Moreover, when the pMRN and ULI are used together, positive patient identification is more efficient and patients are more confidently linked to their Connect Care record. The new pMRN will apply wherever Connect Care serves as the record of care, including at partner sites such as Covenant Health. As work continues on Connect Care, Alberta Health Services (AHS) Community Engagement & Communications wants to make sure you are getting the information you need, in ways that work for you. Connect Care will transform care in our province and change the way we work. To help us better understand your awareness about Connect Care and the best ways to keep you informed, we invite you to take a short online survey. It will take about two minutes to complete, and your responses are anonymous. The survey will remain open until end of day, December 15. Please encourage your teams and colleagues to take the survey as well. Your feedback will help shape future communications and engagement related to Connect Care. We will repeat this survey regularly to track how we are doing. We sincerely appreciate your time and valuable input. 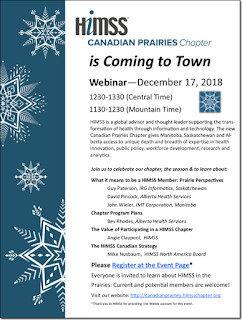 We would like to invite members of the Alberta Health Services health informatics communities to join colleagues from across Manitoba, Saskatchewan and Alberta to celebrate the season and our first HIMSS Canadian Prairies Chapter event – a webinar: HIMSS Canadian Prairies Chapter is Coming to Town. Presenters will reflect on their health IT views and experiences from Alberta, Saskatchewan, Manitoba and HIMSS International. HIMSS is a global advisor and thought leader supporting the transformation of health through information and technology. As a mission driven non-profit, HIMSS offers a unique depth and breadth of expertise in health innovation, public policy, workforce development, research and analytics to advise global leaders, stakeholders and influencers on best practices in health information and technology. Chapters represent the grassroots of HIMSS. 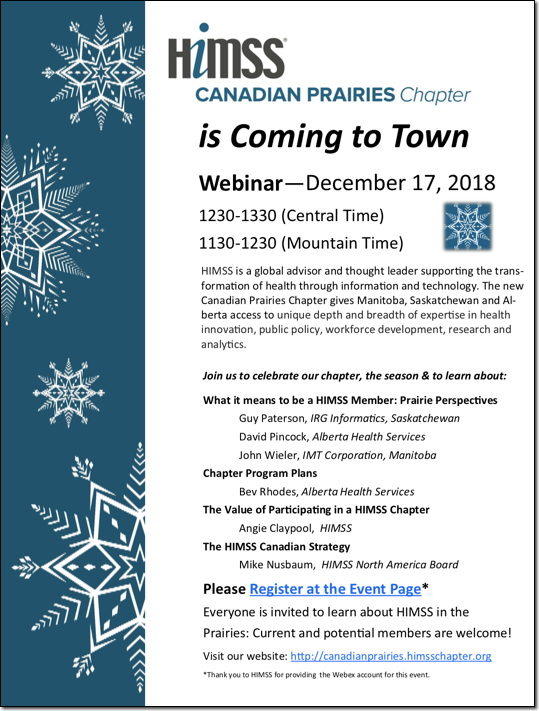 Canadian Prairies Chapter of HIMSS is the newest of the 57 chapters that serve a valuable role in bringing healthcare system professionals together in a local forum. We look forward to “seeing” you at this virtual event on December 17th. Please share with your colleagues and within your networks – everyone is invited to attend, whether they are already a HIMSS member, or are just considering it. To register for the event, click here. Data conversion is about how historical health information is selected and managed for transfer from legacy information systems to the Connect Care clinical information system (CIS). Considerations include which information to transfer, how it should be transformed, how much to include, and how to make it accessible. The conversion of data transferred from legacy systems to the CIS started in early 2018 and will be completed by the Wave 1 launch in November 2019, providing physicians and clinicians with the information they need for decision-making and patient care. Connect Care Groundwork and Scoping Recommendations helped set the conversion project scope. Appropriate data types were prioritized into three tiers based on clinical value and conversion effort. Tier 1 includes allergies, encounters (admissions, transfers and discharges), imaging, labs and problem lists. Work on converting these data types has begun. Tier 2 and Tier 3 data types are still being finalized by the conversion team. Details will be released as they become available. Based on this analysis, a conversion list describes systems that will be integrated and data types that will be converted. No important clinical data will be lost during the migration to Connect Care. Before July 2017 several clinical data types were not consistently defined using measures or ranges standardized across Alberta. Accordingly, July 2017 serves as the default start date for data conversion into the Connect Care CIS. Other systems, including Alberta Netcare (launched directly into the right chart) will make historical data accessible to clinicians. A 1-page ‘Byte’ and a more detailed ‘FAQ’ provide information about Application Integration and Data Conversion, both available on Insite and the Connect Care Clinician Handbook. Clinicians have been asking about how they will access information from health information systems that will be fully integrated into the Connect Care clinical information system (CIS); and how the provincial CIS will work with those few applications that AHS will keep in parallel with the CIS. The majority of AHS’s health information systems will be integrated into the Connect Care CIS, with functions and databases replaced by a seamless information environment. The integration work will involve data conversion, so that information from replaced systems is transformed to fit CIS data definitions, decision supports and other dependencies. Not all data will be suitable for conversion, leaving some historical material outside of the CIS for a period of time. Clinicians will be able to access this data for as long as it is needed. While the Connect Care CIS will be a pivotal integrative technology, some external applications are needed to support the whole of AHS' business operations over time. If and how these applications will "talk" to each other (interoperate) is also addressed by the Connect Care Integration strategy. Integration and interoperation of health data are intensive processes, requiring technical specialists to build transfers and exchanges. A list of integrations to be completed as part of the Connect Care initiative is maintained within Connect Care SharePoint spaces. The list includes all integrations confirmed by the Connect Care Executive Committee (CCEC). Scope management is about how we identify important CIS clinical, functional or safety gaps, prioritize gap-mitigation strategies and select systems that fill gaps while working with the CIS. We posted about Connect Care scope management over a year ago, emphasizing a principles-based approach to decision-making about which health information systems to integrate into the provincial clinical information system (CIS). We later reported about methods for choosing which data, and how much, to transfer from retiring information systems to Connect Care and later still surfaced options for accessing historical data that may remain in legacy systems. As we get closer to implementation, there is more clarity about which applications are integrated into the CIS and what data can be converted. The short Byte and Principles, linked below, have been updated. Improved SharePoint resources cover all aspects of scope management, including a list of all integrations to be completed as part of the Connect Care initiative. The presentation gives a reminder about scope management principles and processes. (note that some links will only work on the AHS intranet). An earlier posting (http://bytesblog.ca/2018/11/25.html) introduced a possible categorization of prescriber responses to clinical information system (CIS) implementation. We wanted to stimulate reflection about how to support change for different CIS-adoption phenotypes, including 'obstructionists', 'minimalists', 'partialists', 'partners' and 'exemplars'. Some colleagues rightly pointed out that the word 'obstructionist' unfairly brands persons who express genuine concern about how a CIS could affect patient care and professional satisfaction. The scientific literature and popular press abound with reports about negative effects of electronic health records. A good point is made, and accepted. We will do our best to avoid harm when working with clinician communities to implement Connect Care. However things unfold, some clinicians will (for whatever reason) oppose implementation. Avoidance could be passive or active. The effect is the same. We have changed the linked backgrounder (and this posting) to refer to "resisters" instead of "obstructionists", as this less judgemental term focuses our attention on the effect of, not the reason for, objecting to CIS implementation. Please always feel free to comment on postings or linked documents. Connect Care is about learning. A summary of key Connect Care happenings in December 2018 has been posted to the Alberta Health Services internal Connect Care website, linked below. Build buckets 1-4 remain a top priority, closely followed by initiation of build for the many specialty clinical system design decisions which have accrued. Training and readiness activities ramp up with substantive new content appearing in Readiness Playbooks, curricula and provider community engagement.